Greenspan Cup is a two-team, 24-person Ryder Cup-type golf tournament played annually among friends, most of whom are either from or live or work in the Seattle area. (Eligibility I Facebook page.) Our average USGA index is 10. The tournament has been played at various locations in the Pacific Northwest and British Columbia — Sunriver and Bandon, OR; Kelowna and Victoria, BC, and Roslyn/Lake Chelan and University Place/Bremerton, WA. It has also been played in Pinehurst and Reno-Tahoe. 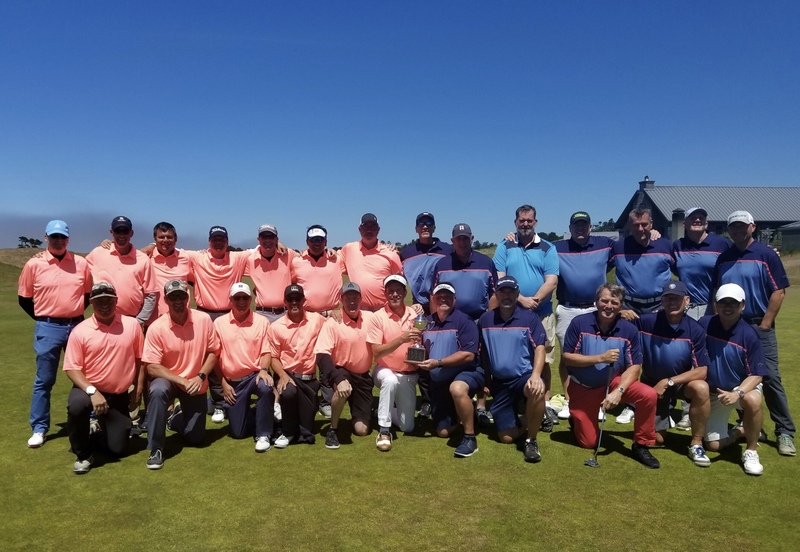 At Bandon Dunes for Greenspan Cup XXI in July 2018. The Cup was named after former Federal Reserve Chairman Alan Greenspan, to whom may of us owed (we thought) our wealth and lifestyles in the late 1990’s. It is the brainchild of Nicholas Jenkins, who came up with the idea after attending the 1997 Ryder Cup at Valderamma in Spain. Longtime friend Norman Cheuk recruited several friends to field an eight-man World Team, and the Cup was born. The tournament has been played every year since 1998. The 2019 event is tentatively planned for Whitefish, Montana.